For the custard, in a bowl add cream and eggs. Whisk until combined. Add cheese, tarragon, and basil. Using a large wooden spoon, gently stir to combine. Set aside. For the filling, in a skillet heat butter over medium heat. Add scallions and leeks and sauté for 3 to 4 minutes or until translucent. Add the tomato concasse and sauté until the liquid evaporates. Remove from heat and set aside. To assemble, gently spoon the filling into the prepared pie crust and spread out to cover bottom of the crust. Gradually pour the custard mixture into the filling. Using a fork, gently stir to distribute the filling ingredients evenly. Set the quiche inside a large baking dish filled with water about halfway up the side of the quiche pan. Place in the oven and bake for 40 to 45 minutes or until a sharp knife comes out clean when inserted in the center of the quiche. Remove from oven and set aside to cool. Serve warm or at room temperature. Makes 8 appetizer (or 6 entrée) servings. Concasse is a French cooking term, meaning to rough chop an ingredient, usually a vegetable. Tomato concasse is a process whereby the tomato is peeled, seeded, skin removed and rough chopped or diced according to specific recipe instructions. 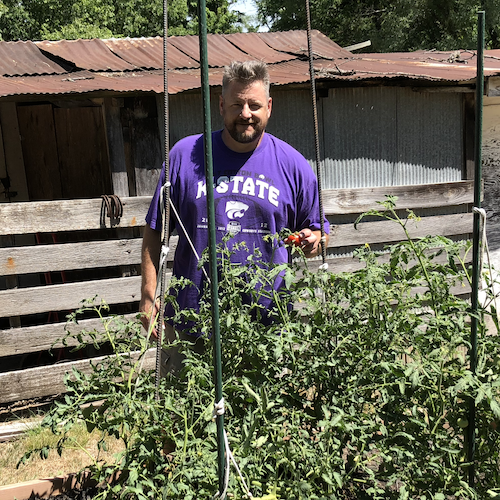 Lenexa owner Andy Wingert is an avid tomato farmer and shares his favorite tomato salad recipe. Put tomatoes and cucumbers in a bowl. In a container with a tight fitting lid, combine the balsamic vinaigrette, Italian seasoning, salt and pepper; shake well. Pour over the vegetables and let sit a bit. Serve. 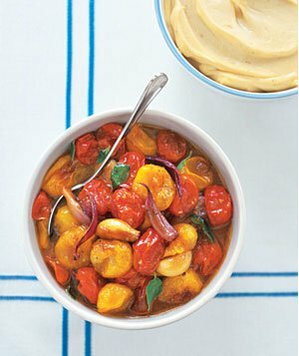 Combine basil, tomatoes, sweet and sour cherries, vinegar, shallot, sugar, and ⅛ tsp. salt in a large bowl; cover and let sit at room temperature 1–2 hours. Remove basil sprig. Purée tomato mixture in a blender until smooth; strain through a fine-mesh sieve into a small bowl, whisk in oil, and season with salt. Season halibut with salt and pepper. Heat 2 Tbsp. oil in a large nonstick pan over medium-high heat. Cook halibut until golden brown and just opaque in the center, about 4 minutes per side. 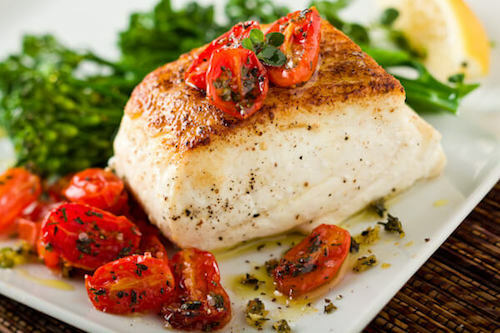 Serve halibut with tomato-cherry vinaigrette, drizzled with oil. 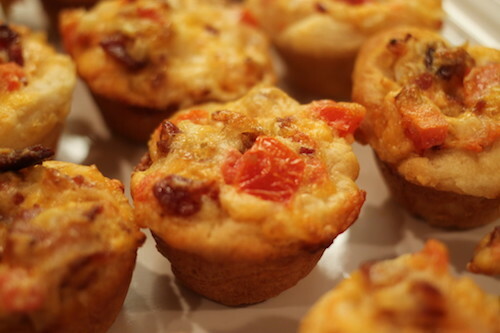 Little buttermilk biscuit cups baked with a savory mixture of bacon and tomato inside. Preheat oven to 375 degrees F (190 degrees C). Lightly grease a mini muffin pan. In a skillet over medium heat, cook bacon until evenly brown. Drain on paper towels. Crumble bacon into a medium mixing bowl; add chopped tomato, onion, Swiss cheese, mayonnaise, and basil. Separate biscuits into halves horizontally. Place each half into prepared mini muffin pan. Fill each biscuit half with the bacon mixture. Bake in preheated oven until golden brown, 10 to 12 minutes. Heat oven to 400° F. Line 2 shallow roasting pans with parchment paper or foil. Arrange the tomatoes in one pan and the onion and garlic in the other. Drizzle both with the oil and vinegar, season with the salt and pepper, and toss to coat. Roast until the tomatoes split (20 minutes) and the onion and garlic have softened (25 minutes). Transfer the tomatoes, onion, garlic, and some of the juices to a bowl. Adjust seasoning, if desired. Add the herb and toss. Let cool. Cover and refrigerate for at least 3 hours. Serve cold or at room temperature.